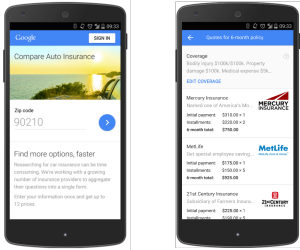 Google confirmed what had already been speculated: It’s getting into the car insurance price comparison business in America. In a post on the Google “Inside AdWords” blog Thursday, AdWords Vice President Jerry Dischler said that Google Compare would be available in California. The product, which lets drivers comparison-shop insurance for their autos in a fashion similar to travel sites like Expedia, already existed in Britain. The product will include ratings and reviews and local support when it expands to more state. Participating insurers will pay Google “a flexible cost-per-acquisition (CPA) model, but payment isn’t a factor in ranking or eligibility,” Dischler wrote. That’s kind of how its ads work — companies owe Google whenever someone clicks on them. It touts quotes from two partners — but intriguingly, none of the Big 4 (State Farm, Geico, Allstate, Progressive, in that market share order). None of them are on the Google Compare website, either. For collision repairers — and probably for insurers too, especially human agents — the move could be trouble. The other issue is that you might not understand what you’ve actually bought. Unlike an airline seat or an item on Google Shopping, an insurance policy is inherently personal — taking into effect what you’ve done, what the insurer thinks you’re going to do, and what you and they think might happen to you. And that doesn’t event get into the insurer’s broader business strategy (advertising, customer service costs, etc.) besides its actuarial risk models. Picking a $120/month policy from one company compared to a $130 one at another might give you a wildly different experience and lead to frustrating situations for both you and your mechanic as you discover what you thought was covered wasn’t.